From the moment you enter the beautiful three-story sun-lit “Best Western Music Capital Inn,” you'll be warmly greeted by a service so outstanding it has been voted by TripAdvisor as a Top Ten Family Friendly Hotel in the United States. The hotel is also a Best Western Chairman award winner. But it's when you get to your room that you truly appreciate choosing the “Best Western Music Capital Inn.” Each of these rooms and suites are spotless and appointed with many amenities that are designed to make you feel right at home. From the in-room coffeemaker, iron and hairdryer to the cable TV with HBO Family®, they’ve thought of everything. Most rooms even have two sink vanities so you don't have to fight over the sink. 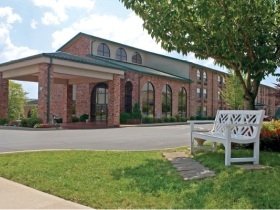 Other reasons to choose the “Best Western Music Capital Inn” are the indoor pool, hot tub, sauna, free hot breakfast, free wireless high-speed Internet access, gift shop, fitness center and game room.